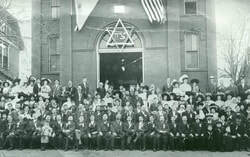 135 years ago twelve Jewish Dallas citizens who believed in the power of communal prayer and celebration founded Congregation Shearith Israel. Now we are more than 1,000 families strong and one of the leading egalitarian congregations of the Conservative movement. Our main location is in the heart of beautiful Preston Hollow, on the corner of Douglas Avenue and Walnut Hill Lane in Dallas. We also offer Friday night and High Holy Days Services at Beit Aryeh on the campus of the Ann and Nate Levine Academy in North Dallas. Our Senior Rabbi Ari Sunshine, brings a passion for community building, outreach, engagement, teaching Torah in many different settings and his love for Israel to our congregation. Additionally, we are richly blessed to have Rabbis Adam Roffman and Shira Wallach, who are creative, inspiring leaders, dedicated to providing innovative, relevant and engaging programs for Shearith Israel members of all ages and interests. Because Jewish prayer and Torah study resonate to the soul through song, Shearith Israel has a long tradition of cantorial music and inspiring tefillah. Under the leadership of Hazzan Itzhak Zhrebker, our congregation seeks to move closer to God through a variety of prayer modalities including traditional Jewish melodies, Klezmer music, new compositions and, sometimes, kabbalat Shabbat prayers sung to familiar Beatles’ tunes. Our congregation is committed to the Jewish future. Our Family Center, directed by Rabbi Wallach, provides creative and innovative programming specifically designed to appeal to young families with babies and preschool-aged children. More than a series of programs, Shearith’s Family Center is a warm, supportive community of bright, fun and open-hearted friends who ensure Jewish continuity in their generation. Community is the soul of our shul and our professional staff work in close partnership with an active lay leadership who bring vast experience to their roles as Officers and Members of the Board of Directors. Shearith Israel has a long history of community leadership. Many of our members serve in positions of leadership both locally and nationally. The most important thing is that we are here for each other. Whether it’s celebrating Shabbat, holidays and simchas, or comforting each other during difficult times, our shul community is an integral part of our members’ lives every day of the year — and has been for more than six generations. That’s what makes our shul the heart of Jewish Dallas. Our students experience Torah lessons and Jewish values in action, in and out of our classrooms by doing! Jewish music and art, literature, culinary exploration and technology are all incorporated into our curriculum, in addition to Hebrew language, Jewish history, ethics, religious texts and prayer. Our religious school is widely admired for how well we prepare students for Bar Mitzvah, Bat Mitzvah and Confirmation — but that’s all in context of the real goal: preparing each child to lead a richly imagined, authentically meaningful Jewish life. 20s & 30s, an initiative of our congregation serves as a social laboratory for inspired Judaism to create a dynamic young community in Dallas. We work to attract singles and couples under 40 who are committed to re-imagining Jewish life in contemporary culture. In 1884, twelve community pioneers gathered in the back of Wasserman’s store on Elm Street in Dallas. They secured a sefer Torah and called their new shul “Shearith Israel”–“the Remnant of Israel.” The first Shabbat services were held above an old grocery and those who came to that first service had no idea of the long history awaiting the tiny Shearith Israel. The founders of Shearith Israel believed in the centrality of the synagogue to daily life. They believed in the enduring value of Jewish rituals, teachings and in the eternal significance of the Torah and the Jewish people. They had faith in the power of community and in the importance of achdut, the sense of all belonging to one family. From its humble beginnings, Shearith Israel was among the few Conservative Congregations in America to pre-date the establishment of the Jewish Theological Seminary. Ours was among the congregations that inspired the early leaders of Conservative Judaism to establish the Seminary, now the world-wide academic and spiritual center of Conservative Judaism. The early leaders of Shearith inspired successive generations to build upon their dream. Over the years, Congregation Shearith Israel firmly established itself as one of the pillars of faith in the city of Dallas and became integral to the development of spiritual life and Jewish learning for area families. Our shul members have always been steadfast leaders in social action and civil rights, as well. Over time, Shearith Israel grew from a humble prayer minyan to include a well-developed religious school and youth program, ultimately founding the Solomon Schechter Academy, the Conservative Day School of Dallas, now renamed The Ann and Nate Levine Academy. The Jewish people are a family whose children are meant to be seen and heard. At Shearith, children are the center of our world…but that requires a tight circle of caring adults around them to give the world definition and support. Without our elders, our children have no role models. Whether it’s a Friday night service followed by kiddush and a lively Shabbat meal, a holiday service or a Bar Mitzvah, wedding or funeral, everyone counts. Congregation Shearith Israel is a second home to our members. It is the place we gather to pray, to learn, to shmooze, to grow and to relax. It is here that we raise ourselves and our children to a life of mitzvot and acts of loving kindness. Shul is the home of many formative experiences. Our shul is so much more than a building, it is where you and your family experience transformative lifecycle events and celebrate the passage of time through the Jewish holidays. Shearith Israel is the spiritual home of Dallas Jewish families. Come take your place!